How much do bloggers really make? These are understandably important questions that you may have. Today, I will be addressing these questions once and for all! Do bloggers really make any money? Why is this even a question in the first place? The truth is, to 90% of the world, blogging is at most a hobby. This means that your Aunt Sally or Uncle Jim is not going to understand how a website online can possibly bring in 5 or 6 figures of income. In fact, even if you’re plugged into the “online” world, it may still be hard to wrap your head around such an idea. I can totally understand – when I was just starting out years ago, I knew cognitively that it was possible to make money blogging, but deep in my heart, I had a tiny doubt that perhaps it’s not possible to make money online. That it’s all a scam that sounds too good to be true. Well, I am here to tell you that it is 100% possible, but really, you have to make your own first sale (even if it is just 5 cents) to see and believe it. So how much do bloggers really make? All that being said, it is dangerous to take a view of blind optimism and think that you will make that coveted 6-figures once you decide to start your blog. Not everyone is going to make it big, for sure. 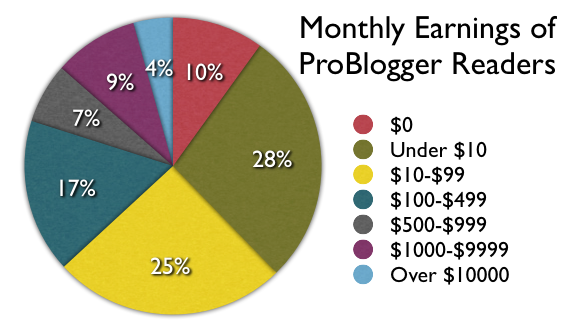 In a survey of 1,500 Problogger readers who were trying to make money blogging, 10% of aspiring bloggers make nothing, and 53% of them make $0.01 – $99 per month. The good news is that the 47% make more than $100 a month. The best part? 13% of surveyed blog readers make at least 5-figures annually, and 4% of them turn their blogs into 6-figure businesses. So yes – while not everyone is going to make anything, you do have a chance of making money if you put your heart into it. Of course, this is only one survey, but it does give you a ballpark. 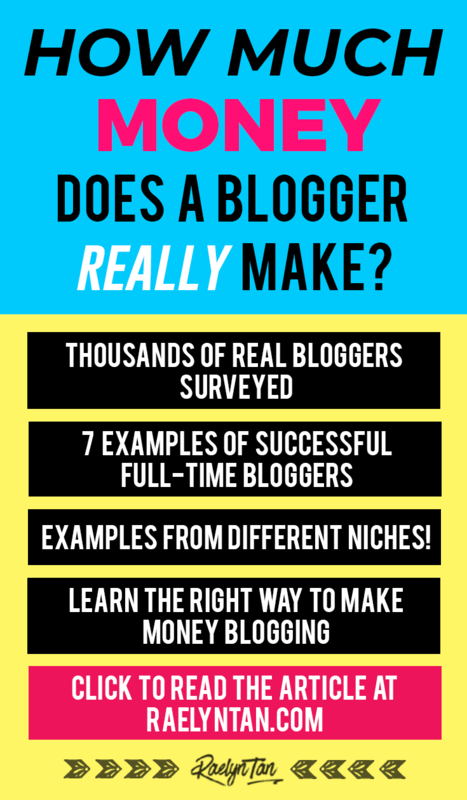 Do note that these bloggers are not necessarily trying to make money blogging – so its a slightly different profile of bloggers from the Problogger survey. This second survey includes hobby bloggers. I hope this helps you to have a perspective! One of the key reasons why bloggers don’t make anything? They monetize their site in the wrong way. Please do not try to monetize your site by ads or sponsorships – you need an insane amount of traffic to even make anything half decent. If all those bloggers who made $0 – $99 a month started monetizing their blog in smarter ways, I am sure they would be making so much more. I recommend providing services, creating courses and affiliate marketing as I have found that these allow you to make more income out of the traffic and audience that you have. Some people have the wrong misconception that you have to blog about blogging to make money blogging. The reason why you see so many income reports of people in this niche is due to your interest is in blogging. You will, of course, visit successful blogs who blog about this topic and inevitably stumble upon a few income reports. Also, people that are not blogging about making money have little incentive to publish their income reports. Only people in the “blogging about blogging” niche are incentivized to publish income reports because they will be able to inspire their readers and be seen as a credible expert, which will help their business. So obviously, if someone is a smoothie blogger, they don’t have to publish income reports because there is no need to. That doesn’t mean they don’t make any money. That took quite a lot of digging – because typically, blogs in other niches have no need to talk about their income. There are still a ton of other websites that are making a full-time income but not talking about it online. So as you can see, it is entirely possible to build a successful blog online. 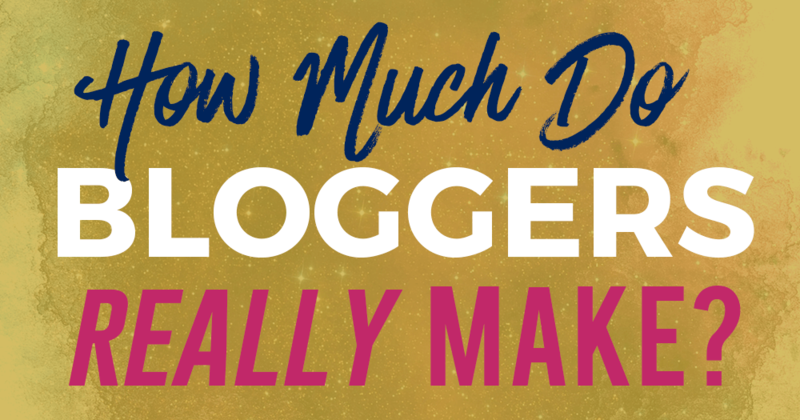 I hope that this article has given you confidence as well as an accurate view of just how much bloggers really make! ***If you’re just starting out (like, you’re a REALLY new blogger and have not started your blog yet), check out this 4-part blogging for beginners guide where you will learn how to start your blog in 20 minutes. It’s been shared over 50,000 times and has helped thousands of new bloggers like you start successful blogs. It’s not that hard. You can do it! I’ll guide you. This is a common question in the newbie community. It’s good to show these statistics to really inspire them. Of course, no one is saying that making money blogging is an easy thing to accomplish. It does take a lot of time and effort to make it happen. But, it is possible for anyone to accomplish this. How did you find out how much survivallife.com earns? Just curious! I agree that it’s a huge misunderstanding that blogging is just a hobby and one should settle for full-time job in office. But the situation is changing as most and most people are coming on board and starting their blogs to earn some extra $$ along with their day job. Thanks for sharing this guide and income reports of other bloggers. Hello, I reallly want to start1 a blog but I am afraid of failling and I don,t know what I would even blog about. My life is a mess right now and I am (I guess) just not ready yet. You say your life is a mess right now.. You could blog about how you are aiming to fix it. This, in turn, may give you focus & help in some way? Good luck & keep at it. A very interesting statistics, Raelyn. Thanks a lot for the job you did! From experience, blogging could be profitable. The problem is most people think that one could earn decent money just via running a blog. They don’t consider an amount of work every successful blogger do besides writing articles. SEO, affiliate marketing, maintaining the website etc. All of these are crucial elements of success in blogging niche. As for me, I decided to not only run a useful blog but to provide writing services. It may not seem like a lot of work to do, but in reality, it takes a lot of time. Ah, yes… people underestimate the amount of time needed!